This is a great tasting traditional baked scone. Add berries, chocolate chips or raisins or any of your favorite additions. Great as a snack or as a side to your meal. You'll find you will want to use this more than bread! Your family will love the variety this scone brings to the table. It can be a key element for your home food storage and preparedness needs. 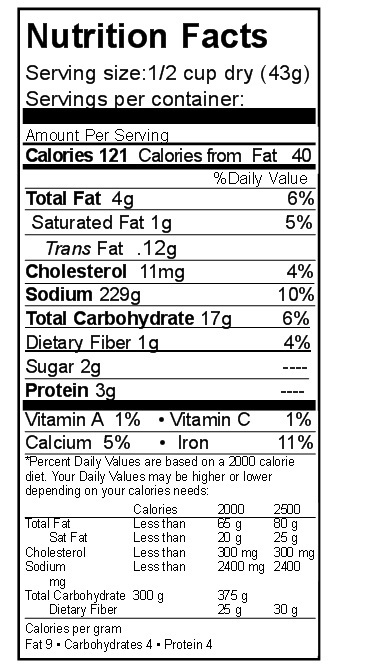 Ingredients: Bleached enriched flour (wheat and malted barley flour, niacin, reduced iron, thiamine mononitrate, riboflavin, folic acid), partially hydrogenated soybean oil, leavening (sodium bicarbonate, sodium aluminum phosphate, monocalcium phosphate), dextrose, buttermilk, whole eggs, nonfat dry milk, soy flour, artificial flavor, salt. Rainy Day Foods has a quick and easy drop scone mix that tastes great. The great tasting variations that can be added to this traditional scone are many - try some traditional ones or make up your own! A delicious mix to include in your food storage. Directions: Mix 3 cups mix with 1 1/4 cups milk. Stir until mixed - avoid over mixing. For better texture add 1-2 tbs. butter or oil. May also add presoaked raisins, chocolate chips, or blueberries. Drop on paper lined sheet pan. Bake at 350 degrees for 8-10 minutes or until lightly browned. May brush with milkd egg wash. Yields approximately 12 scones.